In April, the Stanford Center for Genomics and Personalized Medicine (SCGPM) adopted the DNAnexus portal for its sequencing facility. 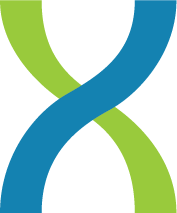 Researchers across nearly eighty laboratories are now able to use SCGPM’s DNAnexus portal to access, share, and analyze their genomic sequencing data. Last Friday, SCGPM and DNAnexus hosted an interactive workshop with the goal of arming these researchers with the necessary tools to conduct bioinformatics tasks in the cloud, and to maximize the utility of the DNAnexus Platform for hundreds of the university’s researchers. 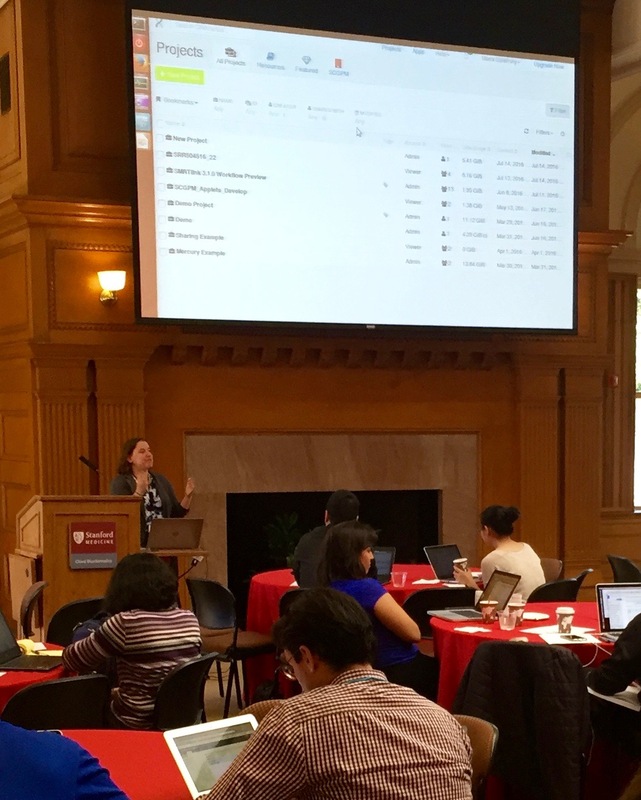 The workshop began with an introduction of the Platform, and moved into demonstrations teaching attendees how to manage, share, and visualize their genomic data through a Web browser. Participants were also taught how to navigate the Platform and perform the same tasks from the command-line interface (CLI). Although you don’t need to be a CLI expert to use DNAnexus, attendees were able to learn some tips and tricks to run analyses and automate tasks using this feature. Attendees of the workshop received first-hand experience building custom applets on the DNAnexus Platform. DNAnexus comes pre-loaded with a variety of different apps, but also allows users to build a custom pipeline or port a local pipeline to the cloud easily. For an in-depth tutorial, visit our Developer Portal. 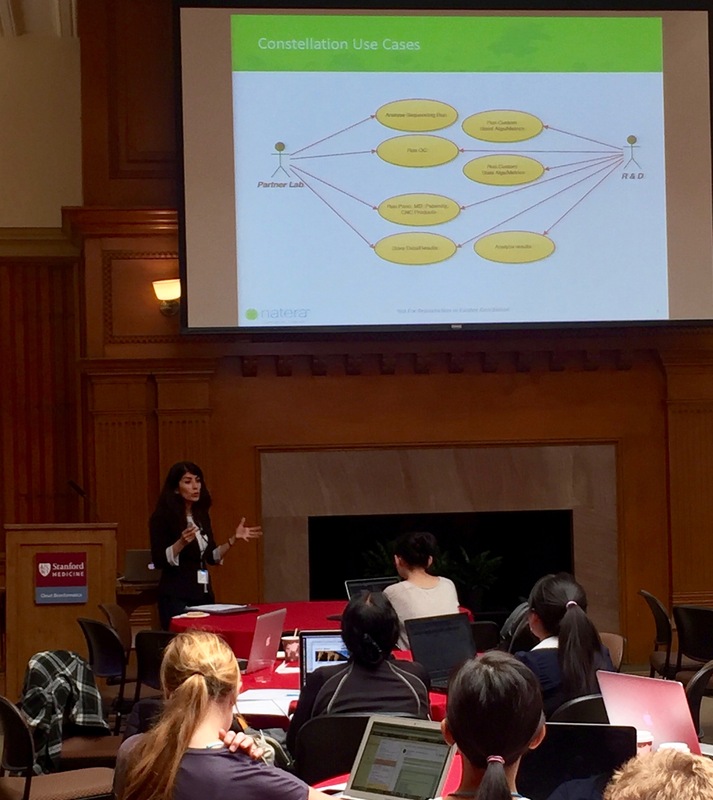 In addition to the hands-on tutorials, attendees heard how genomics experts from Stanford, Natera, and CareDx are using DNAnexus to support their genomic research. Ramesh Nair, Bioinformatics Manager at Stanford Center of Excellence in Stem Cell Genomics, presented on how he uses DNAnexus to support his RNA-sequencing analysis. He highlighted some best practice pipelines to use for RNA-seq and variant calling and discussed read mapping and transcript quantification strategies. Nair also demonstrated how he conducts his RNA-seq analysis on DNAnexus, giving the researchers a glimpse into wide array of applications of the Platform. Raheleh Salari, Bioinformatics Manager at Natera, presented how DNAnexus is being used in industry to advance cancer diagnostics. In her talk, titled “Liquid Biopsy: The Next Gold Standard for Diagnosis”, Salari emphasized the benefits of liquid biopsy, including less patient risk, less costly analysis, and the ability to detect cancer at a much earlier stage than traditional tissue biopsies. Furthermore, liquid biopsies have the potential to provide a more complete view of the tumor genetic composition. Natera adopted DNAnexus in January 2015, and has since used the Platform to support data analysis, storage, and sharing of its genetic tests. Natera continues to use DNAnexus as it enters the oncology screening market. We were also honored to hear from David Ross, Senior Director of Bioinformatics at CareDx, who discussed moving organ transplant diagnostic analysis to the cloud on DNAnexus. Ross presented on AlloSure, CareDx’s next-generation sequencing test for measuring the percentage of donor-derived cell-free DNA (dd-cfDNA) in solid organ transplant recipients. Based on analytical and clinical validity, results demonstrate increased levels of dd-cfDNA in acute kidney rejection using the non-invasive AlloSure assay. Ross also placed a heavy focus on the need for collaboration and data sharing within the transplant community to lead to rapid advancements. The data sharing capabilities of DNAnexus make this kind of collaboration possible. Through the tutorials and lessons from customer use cases, our hope is that researchers left feeling empowered to use the DNAnexus Platform for their bioinformatics tasks, as well as how DNAnexus can support their broad research initiatives. If you missed the workshop and want to learn for yourself how to get started on the Platform, take a video tour through a collection of videos in our knowledge center.